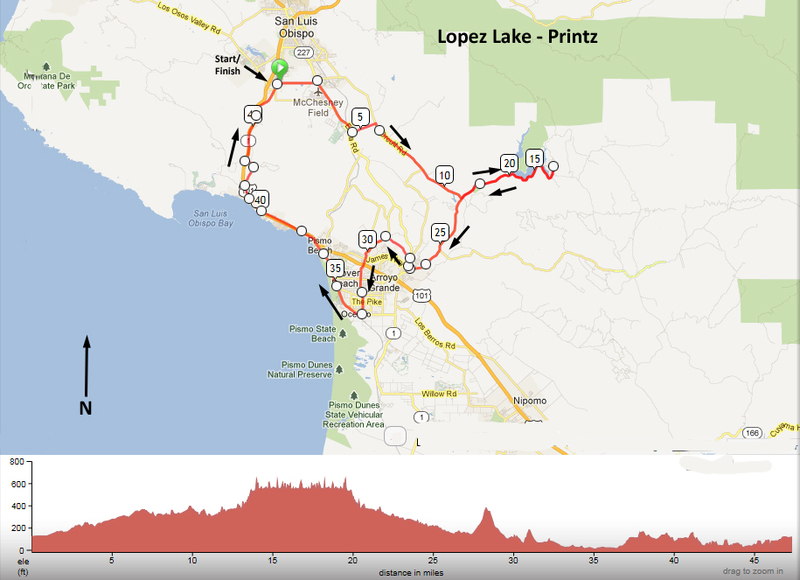 Lopez Lake then descend to Arroyo Grande, Up Printz, then on to Oceano. From Oceano it’s straight back to SLO on Hwy 1.
miles or so…. No Lunch or Coffee stops until the end. This Saturday’s ride will meet at Starbucks and go south to Tiffany rd. in Arroyo Grande then head back in to SLO on Orcutt Rd. The route will continue thru the Poly Campus then pick-up hwy 1 to Morro Bay. From Morro it’s up and over Turri Rd and back to the start. 1. You are accountable for yourself and your decisions. 2. Compliance with traffic laws is your responsibility. It’s your responsibility to ride safely and obey the law regardless of what other people do. This includes blindly following someone through stop lights and stop signs. 3. You are responsible for your front wheel and where it goes. Don’t overlap wheels with the rider in front of you. Leave adequate room between yourself and the rider in front to avoid hitting them if they stop suddenly. 4. You are responsible for the rider behind you. Be predictable, hold a straight line (don’t weave around), don’t slow down and speed up. Let the rider behind you know if you’re are pulling over to stop, pulling out of the group, or slowing down. 5. Don’t feel comfortable riding close to someone for whatever reason? Pull out of the group and talk to the ride leader. 6. Call out hazards and point to them! 7. Never assume that when someone calls out clear that you can act safely. Always look and verify that the road is clear. 8. Ride single file and don’t pace-line if you’ve never done it before. 10. Respect motorist………….they are bigger, heavier and more deadly than you……..duh! 11. No passing on the right, call out passing on left. 12. Don’t even think about talking on your cell phone while riding a bike! If you have to take a call pull off to the right of the road to do it. If not, you may find your phone stuffed in your water bottle! 13. Headphones. If you’re wearing headphones for anything other than a hearing aid you pose a risk to everyone around you….did you hear that? 15. Inspect your bike and ensure that your tires are safe, the wheels secured properly and your brakes are operational. Knee and hip pain are the most common cycling injuries. The most common cause of knee (and hip pain) in cyclists is iliotibial band (IT band) syndrome. The IT band is a thick fibrous band of tissue, which runs on the outside of the leg from the hip to the knee. Pain is caused when the band becomes tight and rubs over the bony prominences of the hip (greater trochanter) and/or the knee (lateral epicondyle). Tight inflexible lower extremity muscles may worsen the condition. As injury is generally a problem of overuse, it is often seen in the cyclist just beginning a training program or early in the training season when the temptation is to do too much too fast. In order to minimize knee and hip pain in the early season, take it easy for the first few weeks – pedal with low resistance and keep that cadence up to at least 80-90 rpm allowing your body to adjust again to road riding. (Likewise with any change that leads to a slightly new bike position.) Minimize hard riding or hill work for the first few weeks. Add in a stretching program for your lower extremities, especially for the gluteus and IT band to help transition you into your riding season. And finally don’t forget about the low back as playing a role in leg pain – especially the back of the leg and hamstrings. All leg pain is not from problems “where it hurts”. A. A lot of leg pain is really back pain. So if you have a history of low back problems from the past, I’d start with a good massage therapist that deals with sports injuries combined with a program of back stretches. One way to classify knee pain (and identify possible solutions) is to look at the location of the pain. A simple seat height adjustment may ease the forces placed on the knee. If the seat is too low, stress is placed on the knee from the patellar and quadriceps tendons and is generally felt anteriorly below the patella where the tension inserts on the tibia. If the seat is too high, pain may develop behind the knee. There are several different ways to determine proper seat height. The easiest way is to allow one pedal to drop to the 6 o’clock position and observe the angle of the knee joint. There should be a 25-30 degree flexion in the knee when the pedal is at the bottom most point. Another is to measure your inseam (in centimeters) and multiply this measurement by 0.883. This should be your distance from the top of the seat to the center of the bottom bracket. If you place your heels on the pedals, have someone else hold the bike, and pedal backwards, your hips should not rock back and forth. Likewise if your hips rock when you are riding lower your saddle until you achieve a smooth pedal stroke. Seat fore/aft position and cleat position may also contribute to knee pain. Saddles that are too far back cause the cyclist to reach for the pedal and stretch the IT band with resultant knee pain. Saddle position can be evaluated with the “plumb bob technique”. Seated with the pedal in the 3 o’clock position, a “plumb” hung from the most forward portion of the knee, should intersect the ball of the foot and the axle of the pedal. Thanks to Chad Asplund and Chris Carmichael (“The Ultimate Ride”) for the following. These comments are meant for those using fixed cleats systems as the newer systems allowing internal and external rotation of the shoe, or “float” (such as the Speedplay system) have minimized cleats as the issue in knee pain. Cleats that are too far internally rotated may cause increased stress to the IT band as it crosses the outside of the knee. This can be caused by a narrow stance width on the pedal (cleats too near the bottom bracket) and generally the toes will point in as you look down from above. The solution is to return the cleat to a more neutral position (let the toes point more fore/aft) and/or widen the stance on the pedal. Remember to make these adjustments in millimeters as a small movement on the cleat can translate into major changes at the knee and hip level. Rotational cleat position can also be evaluated by use of a commercial/bike shop “fit kit” or rotational adjustment device – this is more important for cleats with less than 5 degrees of float. Medial knee pain can result from external rotation (toes pointing outward) and/or stance too wide on the pedals. As you might surmise, the remedy is to align cleat toward neutral with the toes more forward) and perhaps narrow the stance on the pedal (move the cleat towards to bottom bracket). Cleats should be positioned fore/aft so that the ball of your foot is directly over the axle of the pedal. Question: I recently rode with an experienced racer. He said my knees are too far out to the side as I pedal, and I would benefit from bringing them closer to the top tube. “Think of holding a ball between your knees,” he said. I’m quite bowlegged (thanks Mom) so for me to make my knees touch the top tube is almost impossible. Should I work on keeping my knees closer to the frame? — Randy S.
Answer: I see quite a few riders with knees splayed outward. This can be caused by anatomical characteristics or bad bike fit — or a combination. Narrower knees are certainly better in terms of aerodynamics. Watching the Tour de France this summer, head-on camera shots made some riders look knock-kneed. But it’s a common misconception that pedaling with knees nearly brushing the top tube increases power. Knee position is determined by your anatomy. Ideally, your knees will be directly over the pedals. But if you’re bowlegged, they will tend to be fairly far from the top tube. Trying to pull them in is likely to strain and ultimately injure ligaments and tendons. If you have had a professional bike fit, let your knees do what they want to do, naturally. That’s the best way to avoid injury and produce the most power your body is capable of generating. The knee joint is basically a ball-and-socket joint, with the ball at the bottom of the femur and the socket at the top of the shinbone or tibia (although a very shallow socket – unlike the hip joint for example). Protecting the front of the relatively unstable knee joint is a third bone, the patella, which is embedded in the quadriceps tendon and which slides in a shallow groove on the femur and tibia. A common cycling-related injury is called chondromalacia, and has to do with irritation of the cartilage behind the patella. This is more commonly seen in women – perhaps because of the angling of the knee related to their wider pelvis. When asked “where does it hurt” the patient often cannot point with a single finger to a specific location but will classically move their palm over the entire anterior knee or patellar area. Another clue is that the knee will often hurt after prolonged flexion (the theatre sign). Chondromalacia is often blamed on lateral movement of the patella which may not “track” smoothly in the patellar groove as it moves. A common prescription to reduce discomfort is strengthening the quadriceps muscles which run along the front of the thigh and help to stabilize the kneecap and counteract or correct this mis-tracking which, with repeated knee bending causes irritation of the tissue behind the patella. Shortening your crank length. Women, in particular, often have a crank that is too long for them, which then places an increased load on the patella when the pedal is at the front of its stroke. Spin at a higher RPM. Pushing big gears at a low RPM puts a tremendous load on the knee. Tendonitis is inflammation of a tendon, usually from overuse. With repeated irritation and thus inflammation, scarring can occur. The tearing and resulting scarring increase friction as the tendon moves. As a result, the tendon might squeak like a rusty hinge or piece of dry leather when you bend your knee. This is called crepitus and reflects both the inflammation and the lack of normal lubrication of the tendon. The result is pain. The patella is the kneecap. It’s surrounded by the tendon structure itself, which connects the quadriceps muscle group to the tibia or lower leg. Your patella is a triangle. If you look down at it, the pain is usually centered on the lower tip (inferior pole) where it connects to the tendon. If the tendinitis is severe, you may get localized swelling. It might look like a little bump or nodule at the lower end of your patella. You will feel pain in the front of the knee, below the patella, when you pedal or walk upstairs, and it will probably be even worse descending stairs. It also hurts when you palpate, or press, on the tendon itself. There may be some swelling. Patellar tendonitis often appears after hard sprinting, big-gear climbing, or off-bike jumping activities. It also can flare up after hard leg presses or squats. Many times it is simply doing too much, too soon in your training program. Treatment includes applying ice up to three times a day and a non-steroidal anti-inflammatory drug (NSAID) with food. Consider raising your saddle height if this is biking related, and pedal easily or stop riding for several days to allow the inflammation to quiet down. Almost everyone has a small leg-length inequality, but a difference of 1/8 inch (3 mm) or so shouldn’t affect your cycling. When the difference is greater, however, it can open the door to a host of leg and back problems. The solution involves either cleat repositioning or, when the inequality is 6 mm or more, a shim under the cleat of the short leg. Here’s a quick way to get a ballpark idea as to whether you might have a problem. Remove your socks and lie on your back on a firm surface. Straighten your spine as much as possible. Have a friend pick up both legs by the heels, shake them gently, stretch them forward and set them down with anklebones (malleoli) touching. Have your friend can see how your ankles match. If the bones are offset (AND you’re experiencing leg or knee problems) it may be worth getting a more precise exam from an orthopedist or sports medicine practitioner. Knee pain generally develops slowly over a number of days and is not an emergency. Immediate care is always available at a walk in clinics, but it is more productive to see your primary care physician or a sports medicine physician as the first step. Dealing with yourself will be the biggest issue. Competitive athletes have a “fear of rest” – yet rest is probably the single most effective treatment. Peer pressure to continue to ride doesn’t help when you are trying to do the right thing for yourself (and your knee). As in any musculoskeletal injury, ice, elevation, and resting the knee are all helpful. Take a few days off and then begin a limited riding program – cut back mileage by 20 – 30 % and spin at a high rpm and in a low gear for a week or two. And the same goes for leg work in the gym. Remember, if you push too hard, you just get to start over again. Mild stretching before and after the ride keep the muscles loose, and icing the knee after the ride may be beneficial as well. Tylenol or NSAIDs such as Motrin are a good start. Motrin can be taken up to 800 mg 3 times a day for a few days, but then drop back to the recommended dose on the bottle. If you have a history of ulcer problems or develop GI side effects, either switch to Tylenol (it helps pain but is not as good an anti-inflammatory) or see your physician for one of the newer medications. Don’t make big changes in your training program – increasing mileage by more than 10% a week is a risk factor for injury as is over zealous interval training. Although water does not provide Calories, adequate fluid intake and hydration is at least as important as Calorie replacement in maximizing your athletic performance. The single biggest mistake of many athletes is their failure to replace their fluid losses during training and competitive events. And this is especially true in cycling where evaporative losses are significant and can go unnoticed even though sweat production and loss through the lungs can easily exceed 2 quarts per hour. To maximize your performance, it is essential that fluid replacement begin early and continue throughout a ride. A South African study comparing two groups of cyclists (one rehydrating, the other not) exercising at 90% of their maximum demonstrated a measurable difference in physical performance as early as 15 minutes into the ride. Fluid losses during exercise result in a decrease in the circulating blood volume as well as the water content of the muscle cells. And the impact on performance is directly related to the level of hydration (or dehydration). Dehydration is defined as a >1% loss of body weight as a result of fluid loss. Unreplaced water losses equal to 2% of body weight (about 3 pounds for the average rider) impact heat regulation, at 3% there is a measurable decrease in muscle cell contraction times, and when fluid losses reach 4% of body weight, there is a 5 to 10% drop in overall performance which can persist for up to 4 hours after rehydration takes place. Thus it is essential to anticipate and regularly replace fluid losses. And thirst is not be a reliable indicator of dehydration as it takes 0.8 – 2% (of body weight) fluid loss to trigger thirst. Maintaining plasma volume is an important strategy to optimize your physical performance. How much water do you need to maintain a normal state of hydration at baseline (without your daily period of exercise)? For a 70 kilogram adult, about 2500 to 3000 cc per day. This is about 4% of your body weight or in terms of energy expenditure, about 1 cc required for each Calorie of energy expenditure per day. If your diet is well balanced, about 1000 cc (4 cups) will come from fruits, vegetables, and other foods eaten. Another 1 cup will be from the metabolism of carbohydrates, and the balance, about 7 cups, should be from fluid you drink. And if you exercise for an hour or two, add in replacement for losses from sweat and respiration. Under normal environmental circumstances, you will lose 1 – 2 liters of sweat per hour, and in the heat this can be as high as 4 – 6 liters per hour. And respiratory fluid losses are not insignificant. Up to 60% of overall fluid loss can be via the lungs – which means that even swimmers can get dehydrated. What are other factors, besides exercise, that can influence your fluid needs (and if not replaced, exacerbate dehydration)? Caffeine – if you are a regular, daily caffeine user, your body will adapt to its diuretic (water losing) effects. On the other hand, if you have been caffeine free for 5 days, and then drink the equivalent of 6 cups (642 mgs of caffeine) over a 24 hour period, you will induce a negative fluid balance of nearly 0.8 kg (equivalent to 3 cups of water). Alcohol – this will decrease ADH secretion and allow increase loss of water via the kidneys. For every 2 drinks, you should take an additional 1 cup of fluid per day. For those who practice the philosophy “if a little is good, a lot is better”, it should be mentioned that there are risks associated with over correcting the fluid losses of exercise. There have been reports of hyponatremia (low blood sodium concentration) leading to seizures in marathon runners who over replaced sweat losses (which contain both salt and water) with electrolyte free water alone. This is rarely a problem for cycling events of less than several hours duration (except under extreme environmental conditions of heat or humidity) and becomes an issue only for events lasting more than 5 hours. If you want a simple measure of the effectiveness of your personal hydration program, weigh yourself before and after a long rides (without clothes to avoid inaccurate weights from sweat soaked clothing). A standard water bottle (20 ounces) weighs about 1 1/4 pounds – or a pound of weight equals 16 ounces (1 pint;2 cups) of fluid; a quart (4 cups) is 2 pounds. This will enable you to tailor YOUR OWN replacement program. Hydrate before, during, and after the ride – force yourself to drink as thirst alone will not reflect complete rehydration, so learn to drink before you are thirsty. Using a CamelBak or similar device on long rides will eliminate worries about stopping and possibly losing your group. Watch the color of your urine, if you are doing a good job on replacement it should be colorless. Don’t skimp when using a sports drink – don’t assume that because they contain electrolytes and carbohydrates you don’t need to drink as much. And the sweet taste often keeps you from drinking, so take an extra bottle of plain water to alternate. Keeping liquids cool has been shown to increase intake on a ride – either add ice the day of the ride or freeze half a water bottle of fluid the night before and top it off with water from the tap or extra sports drink just before the race. Weigh yourself before and after the ride – most of your weight loss will be fluid (2 pounds equals 1 quart or “a pint’s a pound”). A drop of a pound or two won’t impair performance, but any more and you need to reassess your personal hydration program. A gain of more than 1 or 2 pounds suggests you are compensating. This is an especially important strategy in hot weather where fluid losses can easily be several quarts an hour. Wear the right clothing – light colored to reflect heat; a loose weave jersey; shorts made of one of the new “wicking” materials. Wear your helmet – modern well vented helmets funnel the wind onto your head and are actually cooler than your bare head, and the helmet material can act to insulate your head from the heat of the sun’s rays. Do electrolyte drinks (those containing minerals such as sodium and potassium) provide an advantage over pure water alone? Not for rides of 1 to 2 hours. When two groups exercised for 2 hours at 67% VO2 max (with average fluid losses of 2300 ml) there was no advantage to rehydrating with electrolyte drinks versus water alone. But as large volumes are needed for rehydration in long events, palatability and digestive tract tolerance are important in the selection of your replacement fluids. And for some riders electrolyte drinks are easier to consume. For longer rides, especially over 5 hours in duration (100 miles) or in conditions of extreme heat and humidity, using electrolyte containing sports drinks for sodium replacement helps to prevent dilutional hyponatremia. In extreme conditions you might consider adding a pinch of salt to each water bottle of electrolyte replacement drink. For example, gatorade doesn’t contain much sodium. This will help to prevent hyponatremia. In the same way, salting your food liberally the day before a hot-weather ride can help and may prevent cramps in susceptible individuals. But if you are any type of sodium restricted diet, check with your physician to make sure that adding salt isn’t a health hazard for you. How about carbohydrates? Two hours is the point at which carbohydrate supplements will consistently improve your performance by supplementing your internal glycogen stores. Cyclists can drink large volumes while competing and in extreme events, such as the Tour de France for example, competitors have been able to replace up to 50% of their energy expenditures drinking 20% carbohydrate solutions at a rate of 2 to 4 quarts an hour. If you’d like, you can calculate your exact Caloric replacement needs based on the duration and average speed of you ride. For a rough estimate, you need approximately 1/3 gram of carbohydrate per pound of body weight per hour to replace Calories expended. Certain carbohydrate containing liquids are more quickly emptied from the stomach and thus the sugar they contain more quickly absorbed into the bloodstream to be delivered to the muscles as an energy alternative to muscle glycogen. Drinks using glucose polymers can deliver additional Calories per ounce of fluid while remaining iso-osmotic) . The temperature of replacement fluids MAY impact the rate of stomach emptying – colder liquids empty more slowly and increase the potential for nausea and delay in getting the electrolytes, water, and glucose into your system. On the other hand, in certain situations, cooler fluids may be more palatable and help to keep you cool (a positive for a ride in extreme conditions). The balance point for drink temperature depends on your personal physiology and the ride conditions, so no absolute recommendations as to the “best” temperature can be made.The same considerations apply to post ride drinks. If you are under time constraints to get back to work, a cool fluid can help you cool down more quickly and cut down your “sweat time”. NO studies have confirmed a benefit of fruit drinks (which contain fructose) over glucose drinks. Although fructose requires less insulin to enter muscle cells, it does not appear to provide a performance advantage for cycling. Taste alone is the only advantage. For many years it was believed that a 2.5% concentration of glucose or glucose polymer molecules was the maximum tolerated without delaying gastric emptying and causing nausea. However a recent study, in cyclists, demonstrated normal gastric emptying with 6 to 8% solutions, and nausea occurred only when concentrations were pushed above 11%. The old standbys – apple juice and cola drinks – have a sugar concentration of around 10%. Although glucose polymer sports drinks can provide more Calories per quart (concentration being equal) studies have failed to demonstrate a performance advantage of complex carbohydrate drinks over the simple sugar drinks alone (assuming the same total Calories were ingested. The advantage of the polymers is the absence of a sweet taste and nauseating properties of high concentration glucose drinks, which can be a barrier to maintaining an adequate fluid intake. The stomach does have volume limits which for most riders is around 800 ml (approximately 1 quart). this is particularly the case when pushing aerobic limits (gastric emptying diminishes as exercise approaches 100% VO2 max). If larger volumes are forced, nausea and abdominal distention can result. For reference, a regular water bottle is 1/2 quart, 16 ounces, or 480 ml.and the large ones are 3/4 quart. You should be able to drink at least 2 bottles per hour. In summary, drinking 1 to 2 quarts per hour of plain water is adequate for rides of 1 1/2 to 2 hours. For longer rides, where the body’s glycogen stores will be depleted, carbohydrate containing fluids take on increased importance (glucose containing liquids can deliver Calories from the mouth to the muscles in as little as 10 minutes as compared to solid foods and energy bars which empty more slowly from the stomach). In most individuals, an 8 to 10 % concentration is the optimal. Glucose polymers provide the ability to increase total Calories per quart without risking the side effect of an unpalatable, sweet taste. Aside from palatability, there is no proven advantage over simple sugar (glucose) drinks. Although there are many commercial drinks available, the old standbys such as apple juice and cola drinks are probably the least expensive per Calorie provided. In the pre and post ride period, the high Calorie, easily absorbed, glucose polymer sports drinks do offer an advantage for rapidly building (or restocking) glycogen stores.For those of you interested in saving a few $$, take a look at this site for some ideas on homemade energy drinks. For longer rides, don’t forget the risks of overdoing rehydration with pure carbohydrate (electrolyte free) drinks alone. If you plan to ride more than two or three hours, it’s worth considering a commercial electrolyte containing drink, and if you are going to be riding 5 hours or more, it is essential to pace your fluid replacement rate (and keep an eye on your weight during training rides to be certain you are not overcompensating). Commercial sports drinks are the easiest, but are pricey. Often times complex carbohydrates can be purchased in a health food store and mixed at home with a flavor of your choice or used to supplement a current favorite drink. Maltodextrin is a corn starch molecule which has been broken down into glucose polymers (chains of glucose molecules). When added to water or other drinks, it increases the energy content without the disadvantage of an overly sweet taste and a highly concentrated solution which will delay gastric emptying. It is useful during exercise or as a post ride supplement, but does not make provide any advantages to breads, cereals, grains, etc. as a regular daily energy source.Directions are usually available from the container, but can vary from 1/2 cup in 8 pounces to 3/4 cup in 32 ounces. You may need to experiment to find the best concentration for your personal physiology. A 16 ounce water bottle (480 cc) of a 7% sugar solution at 4 Cal per gram of carbohydrate will contain about 136 Calories. If you add 1/2 cup of Carboplex (a commercial maltodextrin) you will add another 220 Calories almost tripling the energy density (concentration) of your drink with minimal chances of nausea or other side effects. Here are some HOMEMADE SPORTS DRINKS. There have been some encouraging studies on the use of glycerol to minimize the negative impact of dehydration on performance. For those interested in a commercial product, try the internutria website. Except under extreme conditions, electrolytes (particularly sodium chloride or salt) do not need to be replaced along with fluids. Q. I currently average about 225 to 250 miles a week with a metric century or a full century on the weekends (and 1 or 2 rest days and recovery ride during the week). I have been weighing myself before rides and after and its a little alarming, on average I lose about 4-6 pounds on every ride I take! I just completed a 70 mile with 3 big climbs, in 4:00:59, when I started I weighed 148 lbs when I finished I weighed 142 lbs! I Drank 4 24 ounce water bottles with Gatorade Endurance formula, had two Gels and a cliff bar (oh yeah and had a cliff bar to start for Breakfast at 6am). I drank so much I feel a little gassy toward the end and did not feel better until i burped many times. Is this weight loss normal for a rider my size? Our average temperature in Phoenix when I ride is 92-95, with a little humidity in July-Aug (30-50%); should I be alarmed? Do I need to rethink my whole hydration plan for the whole ride? – C.H. A. When you lose weight on a ride, you can assume it is water weight – so you were 6 pounds or a quart and a half behind in fluids (a quart or 4 cups = 2 pounds)at the end of the ride. (In ounces, that is 16 x 6 or 96 ounces.) That is 4% of your body weight – which will impact your performance. The bottom line – you do need to rethink your hydration plan. Over the four hours, you drank 96 ounces or 24 ounces per hour. I think that is about the maximum you can take in per hour (and empty from your stomach). But you may get some additional benefit by drinking 20 oz of cool water 2 hours before exercise and another 8 to 16 ounces 30 minutes before exercise to assure that you are fully hydrated when you start. You might consider trying other sports drinks as sometimes one will agree with your physiology better than another and thus empty a bit more quickly from your stomach. Other strategies would include proper clothing (white to reflect the heat), and I’d also think about switching to a completely liquid diet for the few hours before and during the ride – even the cliff bar may be enough to lengthen gastric emptying time and contribute to the bloated feeling. Q.Do you know of any recipes for sugar free sports drinks?? My daughter is rotting her teeth, partly because of the dehydration from running, and partly because of sports drinks.? We’d like to mix up something ourselves. – T.
Water (this could come right from the tap as well. electolytes (salt being the most common, then perhaps potassium). But unless she is running 5 hour marathons, probably not a big deal. carbohydrate – to replace what is being metabolized anbd which is what works to promote tooth decay. A complex carb migh be less of a problem (carboplex) but anything with simple glucose or sucrose is going to be a problem with a sugar film on the teeth to aid the bacteria which cause decay. Any flavored water (may are commercially available) would work to provide the fluid and a better taste than just water alone. But if she is exercising more than 2 hours she will start to run out of carbs. How long does she run?? Does she brush immediately afterwards (which might help a bit to eliminate the sugar rich coating on her teeth). Heat exhaustion: This condition often occurs when people exercise (work or play) in a hot, humid place and body fluids are lost through sweating, causing the body to overheat. The person’s temperature may be elevated, but not above 104°F. Heat stroke: This medical condition is life-threatening. The person’s cooling system, which is controlled by the brain, stops working and the internal body temperature rises to the point where brain damage or damage to other internal organs may result (temperature may reach 105+°F). Heat exhaustion is typically caused when people who are not well adjusted to heat exercise in a hot, humid environment. · At high temperatures, the body cools itself largely through evaporation of sweat. · When it is very humid, this mechanism does not work properly. · The body loses a combination of fluids and salts (electrolytes). · When this is accompanied by an inadequate replacement of fluids, disturbances in the circulation may result that are similar to a mild form of shock. · Heat stroke may often develop rapidly. · Medical conditions or medications that impair the body’s ability to sweat may predispose people to this problem. · The classic form occurs in people whose cooling mechanisms are impaired. · The exertional form occurs in previously healthy people who are undergoing strenuous activity in a hot environment. · Infants and the elderly are more likely to have this problem,as are those who are taking antihistamines and certain types of medication for high blood pressure or depression. As with all other medical problems, a doctor should be called if you are not sure what is wrong, if you do not know what to do for the problem, or if the person is not responding to what you are doing for them. Call a doctor for heat exhaustion if the person is unable to keep fluids down or if their mental status begins to deteriorate. Symptoms of shortness of breath, chest pain, or abdominal pain may indicate that the heat exhaustion is accompanied by more serious medical problems. Suspected heat stroke is a true, life-threatening medical emergency. Call for an ambulance and request information as to what to do until the ambulance arrives. · A person with suspected heat stroke should always go to the hospital (or call for an ambulance) at once. · Blood tests to check for organ damage may be indicated, however, no specific radiologic (imaging) tests are necessary. Home care is appropriate for mild forms of heat exhaustion. Heat stroke is a medical emergency, and an ambulance should be called immediately. · Rest in a cool, shaded area. · Give cool fluids such as water or sports drinks (that will replace the salt that has been lost). Salty snacks are appropriate as tolerated. · Loosen or remove clothing. · Apply cool water to skin. · Do not use an alcohol rub. · Do not give any beverages containing alcohol or caffeine. · Move the person to a cooler environment, or place him or her in a cool bath of water (as long as he or she is conscious and can be attended continuously). · Alternatively, moisten the skin with lukewarm water and use a fan to blow cool air across the skin. · Give cool beverages by mouth only if the person has a normal mental state and can tolerate it. · The treatment is directed at cooling the patient in a controlled fashion while making sure that the patient stays hydrated and that their blood flow is normal. · Because heat exhaustion generally develops gradually, a person will often be dehydrated. Usually they may be given something to drink, and a cool sport beverage (with 6% or less glucose) should be used. IV fluid may be used if the person does not tolerate oral replacement (if he or she cannot keep anything down). · The patient should stay in a cool environment and avoid strenuous activity for several days. · Treatment is aimed at reducing the patient’s core temperature to normal as quickly as possible. · The doctor may use immersion, evaporative, or invasive cooling techniques. · In the evaporative technique, cold or ice packs may be placed in the armpits or groin. The skin is kept moist with cool fluid, and fans are directed to blow across the body. · An IV will be started and fluids are given rapidly. · The patient’s urine output will be monitored. · Treatment will continue until the patient’s body core temperature is 101.3-102.2°F (38.5-39°C) and then stopped to keep from making the patient too cold. · The patient most likely be admitted to the hospital for further blood tests and observation. · Before leaving the doctor’s office or hospital, be sure the patient understands the instructions that are given by the physician, in particular the information regarding work and activity restrictions. Make sure the patient has a cool environment and plenty of suitable beverages (without alcohol or caffeine). · Avoid heat exhaustion by not engaging in strenuous activity in hot, humid environments. People who are not used to the heat should be particularly careful. Intersperse periods of rest in a cool environment with plenty of available fluids to drink. Avoid strenuous activities during the hottest part of the day. · Heat stroke often occurs in people who are unable to modify their environments: infants, the elderly, and bed-ridden people. People who are taking many types of blood pressure, allergy, or depression medication may also be particularly at risk and should avoid hot environments. · People in supervisory positions such as coaches, trainers, and lifeguards should be trained to specifically recognize signs of heat illness and what preventive measures to take. The prognosis is related to the severity of the heat exposure and the patient’s general medical condition. The very young and the very old have the worst outcomes. In general, the prognosis with heat exhaustion is excellent, with full recovery expected. However, with heat stroke, permanent nerve, heart, liver, or kidney problems, or even death, can occur. As cyclists we’re responsible for knowing the state of our equipment. Periodic bike inspection is an absolute must. A crash demands an immediate exam — especially when there’s been an impact involving the front end. Front Wheel Impacts. This includes riding into a curb, into a nasty pothole, or into any other immovable object. You don’t need to be going fast or even crash to ruin a fork. If you suspect it was damaged by a hard hit, get on the cell phone and call for a ride. Yours is over. With a carbon fork, the damage may be internal and unseen. The fork must be pulled from the frame to check for injury to the steerer tube, the fork legs or the crown. A simple look while it’s still in the frame is not enough. Take it out and put it under a bright light. You’re looking for cracks, dents, dings and bent or loose dropouts. Gouges, discoloration, peeling, delamination — all spell impending disaster. So do buzzing sounds from inside the legs during riding. And then there’s the tell-tale sensation that the bike doesn’t steer or behave like it used to. If you lack the experience to do this kind of inspection, take your bike to the most experienced mechanic at your Local Bike Shop. He/she might just save your life. With a steel fork, a big frontal impact will generally bend the fork (or more likely the frame). I have seen steel forks bent to ridiculous angles, but I’ve never seen one fail catastrophically under a rider. That’s a testimony to steel’s ultimate strength and forgiveness. If you’re riding on an aluminum fork you should have replaced it eons ago. Aluminum forks become mushy and flexible over time. I’ve never thought aluminum is a good choice for a fork. The only time I had a bike with one, I worried so much that I got rid of that rig after only two months. The fork was way light and it was good on rough pavement, but it seemed like an accident waiting to happen. Garage Calamities. I hope this has never happened to you, but it’s happened to plenty of tired riders driving home with the bike on top. One push of the garage door’s remote button and in a nano-second . . . disaster! After calming down, you need to take the bike (and what remains of the roof rack) to the LBS. It’s going to take time to check everything that could be damaged. If it’s only the fork you were lucky in the extreme. Make your next stop at the auto body shop, then drop by the local construction contractor to arrange for a repair estimate. Don’t forget to mention that the garage door no longer works. Never, ever take a chance on fork failure. Sure, a good bike’s fork is expensive to replace. But that pales in comparison to the pain of a crash and cost of an ER visit. It’s like the lady told me when I was looking at a Rhodesian Ridgeback puppy for $400: “If you can’t afford to buy the puppy, you can’t afford to own the dog.” She was right. Over the lifespan of that dog, 400 bucks was nothing. With our bikes it’s the same. We must maintain our equipment and spend what it takes to replace anything that’s questionable. Especially the fork.